By GU-11, March 2, 2013 in The Workshop! I've pretty much given up looking for an AC adapter for my Tamiya basic compressor by myself. Either I've been looking in all the wrong places, or it's just that illusive. Currently asking someone else to find it for me. Hopefully he'll come through. Anyways, I got myself one of those rechargeable battery packs they use for Tamiya RC cars, which the compressor also uses. Thing is, the charger doesn't have any LED indicators or auto-shutdown. I don't want to overcharge the batteries. I remember the guy at the store saying it should be charged for 12 hours, but I'm not sure if that's only for the first time before using it or every time. I hate to drive all the way back to the store (pretty far from where I live) to ask them, and googling didn't turn up anything useful. ONE MORE THING: Might I be able to splice a Tamiya male connector to the battery charger, attach it via the battery connector and use it as an AC adapter? It sounds workable, but I don't want to risk it without knowing for sure that it works. Dude why not just look up the phone number of the shop and call them? I'm sure someone there would be able to help with the question about charge time. Is THIS the kind of set up your compressor has? Could you find niether an adaptor nor the specific battery pack for it? where did you buy the compressor from? Are yo suggesting having the battery pack in the charger and connected to the compressor while having the charger plugged into the wall - like in a typical laptop set-up? Something tells me that is not a good idea. The charger and batteries were not meant to be used that way. You'd probably be looking at a lot of heat build up at the very least. Are the specs printed on the input to the compressor? The battery specs on the one Chas pointed to say: 7.2v, 20min w/ 1400mAh or 30min w/ 1700mAh. That comes out to 4.2A and 3.4A continuous current while the compressor is running. If you decide to go for this, please confirm that the output is DC, not AC! 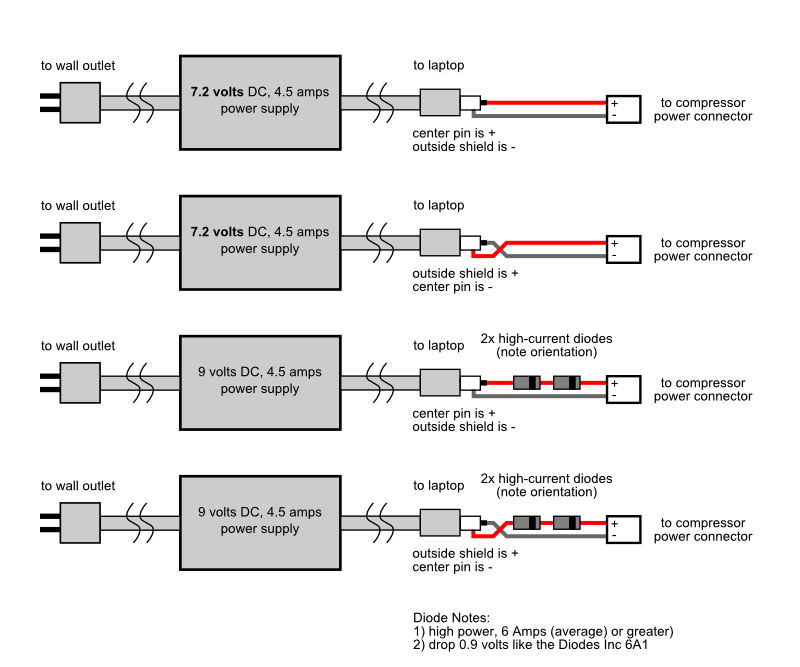 use a higher current rating if possible; 3.5A will work but 4.5A would be much better. the output voltage will be 7.8v or higher when you first power on the adapter (w/the diodes) and will drop to 7.3v or 7.2v under load. check and double-check the polarity on the compressor before you connect; key it if you can. It seems like a bit of work but it should do. Or you can just stick w/ the batteries & chargers. Good luck! ps - Do not connect the battery charger directly to the compressor. Edit: to check adapter for DC output, not AC. Chas, MT, Grapetang, thanks for the replies! @Chas: Yeah, that's the setup I've got. The local website for the shop is defunct, so it's pretty hard to get either a phone number or an email address. No, I don't mean to use the battery and charger like a laptop. What I meant was to use the charger as I would an adapter, as in plugging the charger directly into the compressor. @MT: It says, ac/dc adapter. The input says AC22- 50/60Hz, while the output says DC 7.2V - 500mA. There's no mention of amps, though. Would that work? I'm thinking it's a trickle charger, too. I guess I'll go ahead and charge it for 12 hours. @grapetang: That sounds a little too complex for me. Well, I guess there's always the batteries to fall back on. Grapetang is on it with the numbers! Yes, 500 mA is for trickle charging. Back in the day, those are what used to come with the R/C cars sets that everyone would throw out because they took all day to charge for a 5-10 min drive! Another possibility is that the motor is not rated for continous use and may be designed to cool between cycles. Compressors do build up heat (besides the motor portion). Unless you're painting something big, I'm sure you'll be fine (if you get an DC power supply). Using the batteries will allow it to cool. Yeah, the user manual recommends only using the compressor for a maximum of 20-30 minutes at a time. I guess I'll leave large surfaces for spray cans, and AB smaller stuff or when I'm detailing stuff. And thanks for caring, MT. I keep hearing of local shops where you can get all sorts of hobby stuff, but they seem to be in the remotest parts of town. And when I finally find the damn place, it's either moved or something. I'm only so-so when it comes to Tamiya stuff, but they're the most available source in town, and probably the whole country. If only I lived closer to the US (close enough that the shipping wouldn't kill my wallet), I'd have gladly bought a Sparmax compressor or whatever online and be done with it. Then again, I'm not even sure if the voltage in the US is the same as Malaysia. Thanks, Kylwell, but the wattage in Malaysia (220) is different from Japan (100), so I'd need a power adapter to use it. And that's exactly what I've been looking for all this while. If it wasn't for this annoying wattage difference (and Tamiya's refusal to adjust the wattage of its spray booths and compressors for import), I wouldn't have had so much trouble getting a spray booth and compressor. Hmm, I know Tamiya makes 220v chargers like this http://www.ebay.com/itm/Universial-AC-Charger-Adapter-Wall-Plugin-Tamiya-connector-220V-50Hz-7-2V-400mA-/330816464964 but I am having trouble finding an AC adapter for that compressor. That looks almost exactly like the charger I've got, except for the brand and mine's 500mA instead of 400. I bought one from the Tamiya shop when I got the battery pack. The local Tamiya stores used to sell power adapters that you could plug straight into the compressor via the battery socket, but for some reason they stopped doing that several years ago. Thanks, MT! I did think of using computer chargers, since the sockets look like they would fit, but I was a little anxious about it, since they weren't designed for compressors. But since you and grapetang recommend it, I guess it should work. One thing, though: Any specific requirement besides the obvious 7.2V voltage and plug type? Don't want to end up blowing up a brand new compressor. And yeah, online shopping is ridiculous when you factor in the shipping cost. But like you said, the cost is worth it if it's the right one and HLJ usually stocks quality stuff. Except in this case, I got screwed over by voltage differences. I like Kylwell's find the best. You could always get an expensive voltage converter. get one with at least 4A(amps) or 4.5A, preferrably higher. make sure it supports your country's power settings; just about all of them do. check the output polarity before you connect; the center pin is typically red/positive(+) but not always. mate the output to a plug like the one on the battery pack (get or scavenge) so you can disconnect; or find a connector that mates to the power supply. You can also cut the output plug off (UNPLUG first!!!) and solder directly to the wires. check & double-check the polarity!!! everything I said earlier still applies, including the disclaimers. If you were local, it would be straight-forward to measure the actual power requirements of the compressor. Ack. Good luck! Many thanks for the detailed explanation, Grapetang! Yeah, I've been looking everywhere for a power converter. I've been told these were sold in electronics stores, but so far I haven't seen one. I hope I won't have to buy one online--I'm not crazy about paying extra for shipping and stuff. I think I can directly plug an Acer laptop charger's connector straight into the compressor --it fit using my laptop's charger, at least, although the voltage is too high (9v)...and I still need it for my laptop. About the diodes, they look like components you'd solder to a electronic board. How do I use them on the connector? As much as I hate to admit it, I know next to nothing about electronics. Grapetang's illustration is great! The diodes will help with the voltage and regualate the flow. Also keep in mind that a DC motor like that is not as sensitive to the voltage. You can go down a little, and up a little. If the motor is the same as in Tamiya's R/C cars, it should take another "cell" like the cars do. That would put it at 8.4VDC. Just watch the temperature (if you can access the motor). Does anyone actually have the AC adapter for this compressor that could provide the output specs (voltage, current, polarity) as printed on the side? Or is it printed on the side of the compressor? I overlooked the fact that the compressor has a power input jack separate from the battery connection. All the 7.2v stuff we've been guessing about applies to the BATTERY INPUT, not the power adapter input and they could be different. Re: diodes: yes, they are electronic components that you (or someone) would have to solder to wires (14 gauge or thicker). UNPLUG first and cut off the output plug to expose the wires and solder directly to those. Wow. Talk about frustrating. Can anyone help with the AC adapter specs? Many thanks for the info, guys! @ MT: The thing about living here is that skilled workers (painters, electricians, plumbers etc.) are so affordable that no one bothers to DIY, meaning tools for these things are scarce at best. I don't have a voltmeter, and I doubt I can find one locally either. @ grapetang: You're right. Getting a power converter would be a better idea than to go the laptop charger/diodes route. Having pre-ordered way too much stuff recently (story of my life), I don't think I can put aside any cash for a pricey power converter. I'll bookmark the site and hope there's still stock available when I can spare the money. @chas: I've been looking for one just like that, hoping to get one in a local store so I won't have to pay extra for shipping and import taxes. It's a shame HLJ or amiami doesn't sell any of these; shipping from Japan is much cheaper for me than the US. And adding to that, I'll still have to buy the SWA-3 adapter from HLJ. But if the ebay seller grapetang linked to sells out, I guess I'll have to bite the bullet and get the power converter AND the SWA-3 adapter. TBH, I'm grateful for the fact that there's actually a power converter available, even if it costs quite a bit. Seriously, I can't thank you all enough for your help. I guess all that's left to do now is to wait until I've paid for all my pre-ordered stuff and pony up the cash for an AC adapter or a power converter. I just hope my wallet survives this; 25-40 USD, and then there's the cost of shipping from the US. On the bright side, at least I've still got my battery pack to fall back on until then. Well I know that over here (Canada) there are stores (in 'ethnic centres' - like 'little India' in Toronto) that specialize in electronis that work with 220 power. The reason is many immigrants will buy stuff to send home to family. These stores also have may types of power converters ( step -up and step-down) that folks buy when they are travelling. So maybe there is something like that where you are in Malaysia? When I moved to Korea for a year in 2006 I found a few power converters in shops like that. If all else fails maybe there's a shop at, or near an airport that might have one. Think about who might need one ( international travellers) and where a good location to find that kind of person would be. Chances are if there are people who would need it someone is going to be there to sell it to them. You just gotta figure out where they are! Why not check around (or in) big Hotels. Hell talk to a concierge or two they ALWAYS know where to get anything! The [ power converter ] --> [ SWA-3 ] --> [ compressor power adapter input jack ] is the best way to go but pricey. Like you said, the battery option still works! The other alternatives are for hacking and plugging into the compressor battery input. There's a very good chance that the laptop output plugs do not fit the compressor's power input jack; the polarity may be off and we still don't know what the input voltage is on that input jack. With a little bit of jury rigging, it'll work. @Chas: Thanks for the ideas! While there aren't shops like you mentioned that cater to immigrants, there is a place where the shops on both sides of a street sell electronic components. Didn't find anything there, though. The hotels and travel items shops are a good idea, though. I might as well looks there, too. @grapetang: About the adapter you mentioned, is it "ready to use," as in I can just plug it straight into the compressor? Just had a thought: isn't there a pretty robust US military (naval) presence in Singapore? I'll betchya that the families of the service men probably use some of those power converters/transformers. Now I don't know how/if Singaporean nationals would be able to access stores on base, but that might be worth a try. Just trying to think outside the spray booth here. No way! Seriously? And I thought my cardboard spraybooth was ghetto. That'd be an option if I lived in Johor, which is a state located right at the southern tip of Malaysia. Less than an hour's drive from Singapore. Thing is, I live in the capital city, which would take an overnight trip on a train to get to Singapore, and who knows how many hours' drive. And if said base were closed to civilians, I'd be kicking myself all day. Honestly, the battery packs aren't so bad, considering all the trouble I'd have to go through to get the adapter or converter. The battery lasts about an hour, and I don't paint anything larger than an MG Gundam kit. Besides, the compressor can't take more than 30 minutes of continuous use anyway. Of course, an adapter would be hassle-free, without having to worry about how much power's left in the battery or leaving it unused for too long. Anyways, thanks for all the great help! Only the [ power converter ] --> [ SWA-3 ] --> [ compressor power adapter input jack ] is "ready to use". The laptop power supplies need work to connect to the input jack (different plug, voltage? polarity) or to the battery connector, so the rechargeable batteries may be the way to go in the short term. Good luck! I guess that means I'd better start saving my pennies for that power converter and SWA-3 adapter. HERE there may be something available through RAKUTEN and they do have an international shipping service. I think THIS ONE should suffice. well I hope everything works out for you! Glad I could help. There are also many power adapters on allicdata.